Hi everyone! Juliana here to share a scrapbook layout and a fun tip on how to color your chipboard. The fun thing about Leaky Shed Studio chipboard is its wonderful versatility. I love that you can easily customize it to fit your style or the theme of your project. One of my favorite go-to methods to personalize chipboard is to use a Krylon Gold Leafing Pen. It's as easy as simply coloring the chipboard with the pen until it is fully covered. I have also noticed that if you do not push down and expel a large amount of the ink, the pen does not fill in or cover up the wonderfully etched details that are present on many of the Leaky Shed Studio chipboard pieces. You can see an example of how these designs are still intact on the Barbed Wire Border and Tiny Horseshoes that I used to help develop the theme of my layout about my husband and our horse Woody. I hope this inspired you to try using a Krylon Gold Leafing Pen on your next chipboard project. 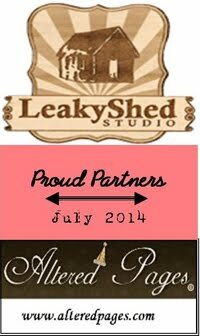 We'd love for you to share your chipboard creations with us on our Leaky Shed Studio Facebook page! Wow wow wow! This is beautiful! LOVING the colors and love love love the horseshoes and barbed wire!!! Great layout Juliana! Perfect chippies for your photo! Absolutely love this page Juliana!! Gorgeous! !